Thanks so much for all of your kind words on the last post! I am enjoying snuggling my baby as priority number one around here. I am soaking up every minute I can. Still, sewing and doing something creative recharges me, so I am happy to find a few minutes here and there to steal away by myself and play with fabric. As I mentioned in my last post, I decided to go in a different direction for my Circle 7 Quilt, and I finally finished my starter block and got it in the mail. Unfortunately, I did not upload and attempt to edit my photos until tonight and the lighting was much weirder than I had realized! So, sorry for the bad photos. I started with my cocoa mugs from my abandoned Row Along project from the Bee in My Bonnet QAL. 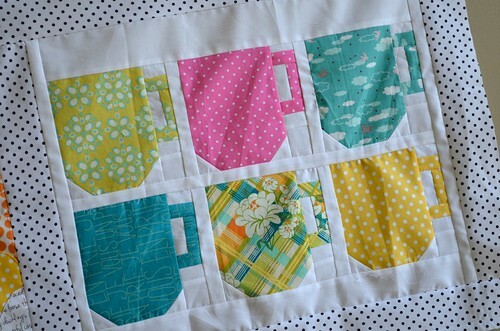 I love these mugs and decided to make this quilt a Happy Quilt. Cocoa Mugs make me happy as it is one of my favorite treats and reminds me of settling in with a good book in a cozy spot. My garden makes me happy, especially being outside in it with my family. 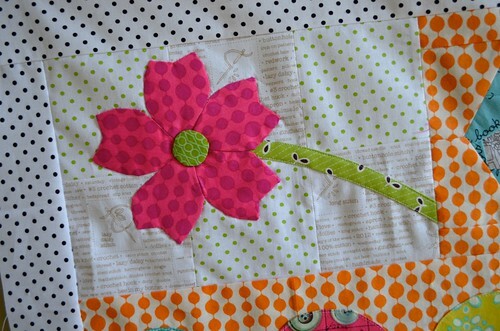 I saw a lovely blossom in the book Playful Patchwork by Suzuko Koseki and made one to add to my quilt. I was going to do two, but that freezer paper and starch applique method is tedious, so I just added a bias tape stem instead. Within a day, Amy came out with her amazing bee hexie and I had to add that to round out my garden. I couldn't have a happy quilt and leave out a reference to the beach! So the clamshells got added. Nothing better than family time on the beach. Finally I added a patchwork border on top with 2.5" squares and almost did it the whole way around, but then I realized I might never stop, so I packed it up to mail. 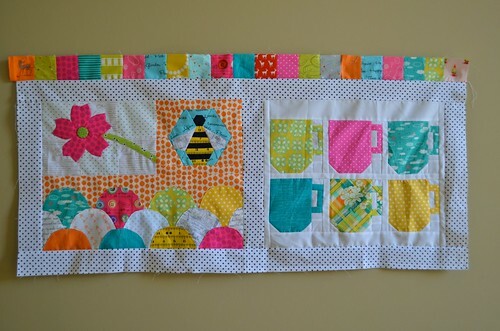 The idea with this traveling quilt bee is that each person will add a little more to it, things that make them happy for my quilt, and eventually you will have an amazing quilt top! 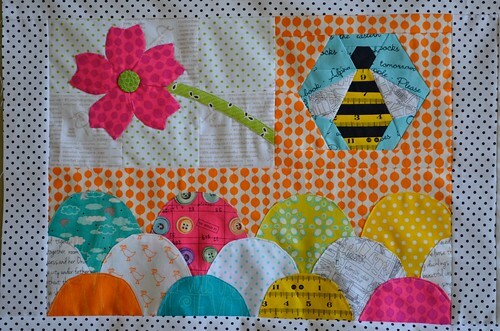 I just can't wait to watch it grow, and show you what additions I make to my bee-mates quilts. super cute! love those mugs.